This week I got some great news: I am going to be doing more research sketching next year, with one of the Morgan Centre team at the University of Manchester. Do you remember that I did some work with Dr Andrew Balmer on dementia research (that's him above, with the beard), as part of my residency? Well, though that was only one day of the whole 10 month residency, he was so pleased with how it went, that he included me in a bid for some new funding, and we got the money - hurrah! 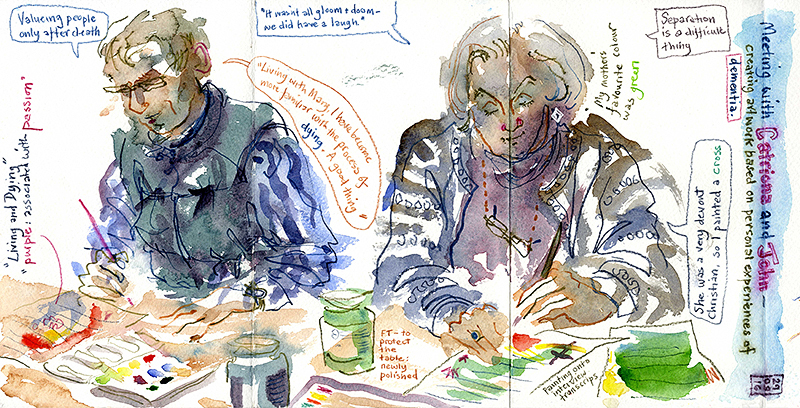 He wants to explore further the idea of dementia and creativity, running six workshops next year, which I will be sketching. We are then going to produce a digital art book to showcase the workshops and sketches. I don't know yet exactly what I'll be recording, but I am assuming it will be similar to the activities we did previously. 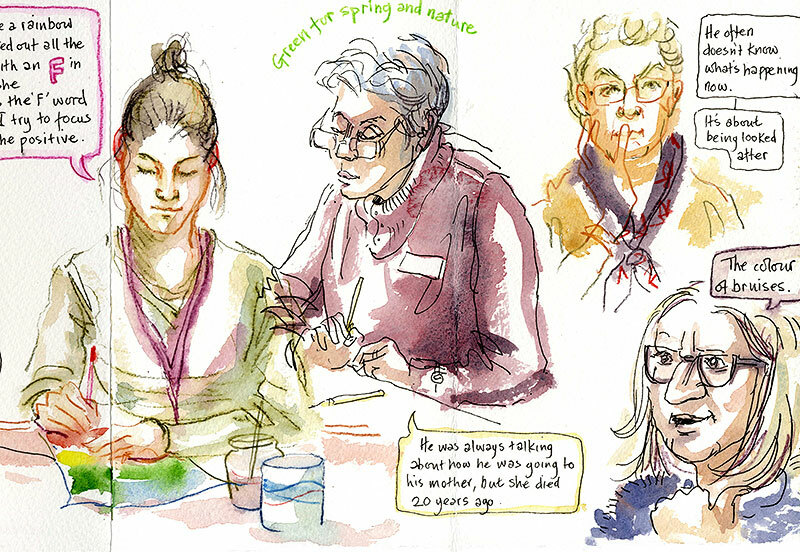 These are the sketches I did on the day we spent together with Alzheimer's carers, a few months back. This is just one of various spin-off work offers which have come in as a result of my Morgan Centre residency. Some are with the researchers there, but I've also had interest from other institutions. It's been a week of ups and downs as, this Friday, I also heard the disappointing news that York University didn't get the funding for a year-long residency they were keen to do with me, looking at the architecture of care homes. That would have been fascinating and have involved all sorts of new challenges. Hey-ho: all the things still in the pipeline rely on bids for funding, so ultimately none of the rest may come off. I'm still really excited to discover that there are clearly more research sketching projects to be had. It's such interesting work and, of course, I get paid for sketching!